The pacu is a South American fish with a taste for nuts, and though it's recently been discovered swimming in Denmark's rivers, there's no need for swimmers to fear for their family jewels. Meet the pacu. This fish is native to the Amazon River, and as with all aquatic creatures from that region of the world, it's developed some terrifying adaptations. If you looked at that fish and thought to yourself, "that's looks like a piranha," then congratulations, you have a good eye for piscine genetics. The pacu is quite similar to the piranha, only instead of razor sharp teeth, the pacu has developed a mouth-full of grinding tools used to crush the nuts and berries that fall into its aquatic habitat. Problematically, these fish aren't terribly discriminating, and have earned a reputation for occasionally chomping on swimmers' testicles, having mistaken them for something a bit less fleshy. Amazon locals have even nicknamed this fish the "ball-cutter." Go ahead. Cringe. That is the appropriate response here. Recently pacu were discovered swimming in Denmark's waterways, which immediately caused a fearful outcry from everyone with external genitalia. The good news is that even those of you who regularly swim in Denmark's rivers aren't in much danger. "All we said last week (with a smile) was that male swimmers should keep their pants on in case there are more pacus out there in our cold Baltic waters," said Peter Rask MÃ¸ller of Denmark's University of Copenhagen. "Its teeth and powerful bite can for sure be dangerous, but to meet one here and is highly unlikely, of course." And now for the bad news: Despite most reports focusing on the pacu's introduction to Denmark, this fish has slowly developed a global presence. Exotic pet stores have been selling the pacu for years, and when introduced to non-native waterways, the pacu can very quickly become a dominant force in the food chain. There have been confirmed pacu sightings in 31 different US states, ranging from Alabama to Washington (though the majority seem to be centered in the Southeastern United States). Texas has even instituted a $100 bounty for any anglers who manage to catch and present a pacu. Does this mean Americans should stay out of the water? Not at all. As with Denmark, your odds of bumping into a pacu are extremely low, and as long as you remember to keep your pants on it will be exceedingly difficult for a hungry pacu to remove your ability to reproduce. 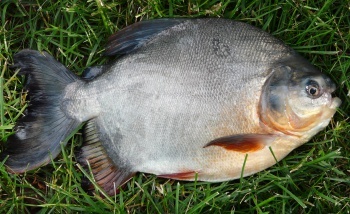 If you do find one however, keep in mind that no less a personage than former President Teddy Roosevelt described the pacu as a "good-sized, deep-bodied fish," which made for "delicious" eating. So remember: If a pacu comes after you with hunger in its beady little eyes, do what millennia of evolution bred you for and eat the lil' fella first.